Atrium Family Dental is an authorized provider of Under Armour Performance Mouthwear. 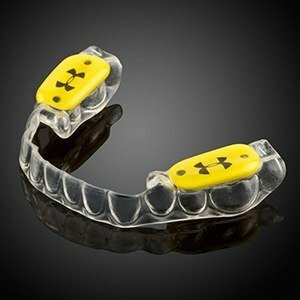 More than just your typical mouthguards, Under Armour Performance Mouthwear utilizes ArmourBite technology to give your smile the protection it deserves and enhance athletic performance. Why Choose Us for UA Mouthguards? Clinically proven to protect your smile from impact (nearly all sport-related incidents are oral injuries), Under Armour Performance Mouthguards are designed for optimal fit and to help improve your performance by reducing your tendency to clench your jaw during training or competing. This patented jaw-positioning technology helps maximize air intake, increasing your endurance and improving your reaction time by up to 12%. Discover how you can give your best performance on the field or on the court and protect your smile with Under Armour Performance Mouthwear! Free your smile from the standard “boil and bite” mouthguards that underperform by contacting our New Lenox, IL dental office today.